Even though the Kentucky General Assembly isn’t in session, I’ve learned that there is plenty of activity to keep Frankfort buzzing during the summer. Work around the Government Nonprofit Contracting Task Force has kept me at the Capitol more than usual this summer. The second Task Force meeting was held earlier this week and will have four more meetings before the Task Force must submit its recommendations for next steps to streamline nonprofit contracts with state government. While the Task Force has much less time to explore the issues and form its recommendations than outlined in the legislation, members are engaged and committed to, at a minimum, determining how this important work to save government and nonprofits time and money should continue beyond the revised report due date of December 1, 2016. I was also unexpectedly busy last week because of a letter KNN submitted during the open comment period for the Bevin administration’s waiver proposal to modify Kentucky’s Medicaid program. If you haven’t read the letter – you can click here to read it. Why did KNN submit the letter to the Bevin Administration? KNN was invited by Governor Bevin’s staff to meet on their proposed Medicaid waiver in June. At that time, the proposal had already been released and meetings for comment had been scheduled around the state. The community engagement piece was already included in their proposal, but the meeting provided KNN with an opportunity to share some of the often overlooked realities of running an effective volunteer program – the resources of staff and finances required for training, support, space, background checks when required, and more. During the meeting, it was communicated that there would be some nonprofits who would not be impacted by this proposal at all because they do not utilize volunteers; there would be some nonprofits who are structured in such a way that they might be able to accommodate the potential influx of volunteers; and other nonprofits who would find great hardship in trying to help their fellow Kentuckians meet this requirement. Concerns were also expressed about nonprofits located in rural communities. Regardless of these realities and concerns, KNN committed to assist in whatever way we could if the requirement remains in the proposal and if the proposal is approved by the federal government. Because members were also expressing concerns on this issue, KNN decided that formalizing the June conversation and directly sharing the member comments we were receiving was important to ensure these thoughts were “on the record” and submitted during the open comment period. KNN submitted the letter because we exist to advance Kentucky’s nonprofit community. Sharing the realities of volunteer management as a part of nonprofit management best practices and serving as a vehicle for member concerns is an example of what we do. It’s our job. It’s why we exist. Is KNN opposed to or in favor of the Medicaid waiver proposal? The letter is straightforward. KNN does not have a position on the Medicaid waiver proposal or more specifically, we do not have a position on the proposed community engagement requirement. KNN’s letter included member comments received via Facebook and email. The only comments that were not included, were a handful from individuals who are not KNN members. None of these comments were supportive of the proposal. With the exception of a few grammatical and spelling corrections, the comments in our letter were not edited or condensed or rephrased because KNN’s letter served as a vehicle for our members – editing comments or choosing which to include or exclude would, in essence, be taking a position. The Bevin Administration’s final Medicaid waiver proposal was submitted on 8/24/16. If the waiver proposal is approved by the federal government, KNN is committed to helping connect our members who are interested in working on this initiative with state government. It is our hope that the letter was helpful to the administration and whatever the outcome, KNN is here as a resource. In summary, I am so grateful to our KNN members who submitted comments via social media and email – it was my privilege to share their front-line experiences and I appreciate each taking time to comment. I also want to thank those nonprofit professionals who took time to email, text and call me last week – 97% (yes, I counted) of these were in appreciation of their state association’s voice on the importance and realities of volunteer management. Of course, we’ll keep you posted! And to those nonprofits who’ve not yet become a member of your state association – I urge you to join KNN and join the conversion. Great news! The Government Nonprofit Contracting Task Force, created with the unanimous passage of HCR 89 in 2015, FINALLY held it’s first meeting today! Please check out the press release to learn more. This Task Force is important not only for organizations contracting with state government, but matters to all nonprofits and will result in savings of time and money that will ultimately benefit Kentuckians across the state. A number of issues (including the recent special elections) delayed our start date, but we are ready to get to work to identify solutions to the unnecessary red tape and duplicative reporting that are keeping nonprofits from doing what they do best – serving Kentuckians. The Task Force’s report of recommendations is due October 31. A request has been made to extend this deadline, though statute requires a final report by December 1 (even if the extension is granted) – which means there is much work ahead and in a short amount of time..
Four nonprofit executives were selected to serve on the Task Force from a list of eight recommended by KNN. These leaders will join me in communicating the issues facing our sector and are committed to actively participating with the Task Force to recommend solutions that will result in improved contractual partnerships – and ultimately improved services for Kentucky’s citizens. I am grateful for their willingness to share their time and expertise! I am also grateful for our KNN members who helped us get this resolution passed in 2015 and I urge you to stay engaged – we are just getting started and as the work of the Task Force evolves, I hope to hear from you. If you aren’t yet a KNN member, now is a great time to join and stand with other nonprofits statewide to help us advance policy efforts that empower our nonprofit sector and strengthen Kentucky. Congrats to KY Gives Day Prize Winners! I’m hitting the road today to take a much-needed vacation. I hope you are planning to take some time off this summer too. We all need an opportunity to recharge our batteries and I cannot wait to recharge mine with my family on the sandy beach of Pawley’s Island, SC! Photo credit to my fabulous sister! Before I go, I’m thrilled to report that the 201 nonprofits participating in Kentucky Gives Day on May 24 raised $181,649 in just 24 hours. I’m even more thrilled to report that the 2016 effort brought our four-year total to $1,113,105! Congratulations to these KNN members winning top fundraising prizes on the big day! Their totals include dollars raised and prizes from KNN. As you can see – some tight competition! Other prize winners include: Toy Chest, Franklin County Women’s Shelter, God’s Pantry Food Bank, Hospice of the Bluegrass and Glean KY. Check out full details on the results! This event was made possible with support of our sponsors: Anthem Blue Cross and Blue Shield in Kentucky; Anthem Medicaid and Keeneland! Our media partners were essential to getting the word out: Ocululs Studios; iHeart Media Lexington; iHeart Media Louisville; Kentucky News Network; WAVE, Louisville; WKYT, Lexington; WPSD, Paducah; WBKO, Bowling Green; WEHT, Evansville; WYMT, Hazard and Lexington Herald-Leader. We were also excited to welcome a regional partner for the first time – Central Kentucky Community Foundation did a fantastic job of bringing twenty-one organizations to KY Gives Day and offering an additional $1000 in prizes to top fundraisers from their region. Time to get our give on! It’s fitting that prom and graduation season tie in so nicely with KY Gives Day. Over 200 nonprofits from across Kentucky are participating on May 24 and they are getting all gussied up – just like we’d do for prom. We are eager to look our best and share our stories on www.kygives.org to encourage more Kentuckians, near and far, to invest in our missions. And like graduation, participating nonprofits are proud of our accomplishments and eager to use the KY Gives Day opportunity to celebrate our work – yet we know KY Gives Day is also only one step of our journey. Our work to improve communities is not done and the quest to acquire new donors and raise needed funds never ends. Please take a minute between now and 11:59pm EST on Tuesday, May 24 to visit www.kygives.org and show some of your favorite causes some love. And good luck to all participating nonprofits – KNN appreciates your commitment to making KY Gives Day 2016 a success and thanks to the support of our KY Gives Day sponsors and partners, we are proud to provide this tool to help you raise needed funds, identify new friends and share your story successfully. Let’s get our give on! So what can we do? Lots. My colleague, Tim Delaney at the National Council of Nonprofits shared excellent thoughts in his article: Earning the Public’s Trust – Every Day. And as Tim mentions, KNN’s Principles & Practices for Nonprofit Excellence in Kentucky tools are an excellent resource. The older I get, the more I learn that there’s little I can control. I can’t control the bad apples that unfortunately exist in our sector – any more than I can convince someone to stop fighting a good piece of legislation, squelch my son’s current fascination with all things inappropriate and gross, or even get the toothpaste back in the tube. Luckily, there are things I can control – steps we as nonprofit leaders can take – and I’m going to channel my energies there. I believe it’s the only way to get the focus where it needs to be – on the important work of our nonprofit sector and it’s impact on our communities. KNN is here to help – to provide our members with resources and tools; to advocate on your behalf when legislation is filed that we think will damage the sector; and to engage our sector in these important conversations. If your nonprofit isn’t a KNN member, I can’t think of a more important time to join your state association of nonprofits. Normally, my lists are long – my work to do list, my personal to do list, my grocery list, my bucket list. But this list is too short – and that’s not good. The current list of registrants for Kentucky Nonprofit Day at the Capitol on February 17 doesn’t reflect the number of nonprofit leaders that, I’m certain, are committed to ensuring a unified voiced for our sector – especially with the opportunities we have to build on our 2015 momentum; introduce the work of the sector and it’s economic imp ortance to a new administration; and remind those running for re-election this fall that we are the state’s third largest industry and we vote. wonder if showing up for events like this really matters. Well, it does. We need you there. You need you there. The sector needs you there. Kentucky’s communities need you there. Please take time to register today. And if you’ve got a willing board member, share this excellent resource and bring them along for the road trip. We look forward to receiving your registration and making the list of nonprofit leaders coming together at the Capitol a longer one. Let’s make this our largest gathering at the Capitol ever! Happy 2016! Just over one year ago, I blogged that you need us and we need you. As I prepared for my first blog of 2016, not much has changed – so why reinvent the wheel, right?!? If anything, KNN has even more to offer our members and with our work ahead, we need you on our team more than ever. So, if you aren’t yet a KNN member or convinced of our need for one another, I hope you’ll take a minute to read my pitch from 2015. In this short year since that blog, we’ve celebrated two legislative victories in the 2015 General Assembly and the U.S. nonprofit sector has also celebrated some major victories. We are ready to roll up our sleeves again for the 2016 session of the Kentucky General Assembly and remain vigilant on federal policy issues with our partner, the National Council of Nonprofits and our state association peers. To prepare for one of our legislative priorities for 2016, we need your help. KNN has again been collaborating with the Office of Secretary of State to continue modernizing and clarifying the laws governing Kentucky nonprofits – building on the work of House Bill 440 in 2015. This quick survey will share the highlights of the recommendations from two task forces and provide you an opportunity to share your feedback on the impact of the recommendations. We need to hear from you – please take a look! Finally, it’s time to remind our legislators and share the news with the new folks that our nonprofit community is More Than Charity. 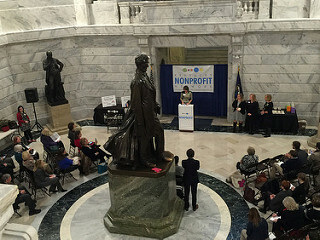 Nonprofits from across Kentucky will be gathering for Kentucky Nonprofit Day at the Capitol on Wednesday, February 17. Given the challenges and opportunities our Commonwealth and our sector are facing, I’m hoping for our biggest crowd ever – please stand with us and register today! I look forward to seeing you soon! Here’s to another fantastic year!